"Piece of Eight" token, awarded by whym. "Like" token, awarded by Krenair. "Piece of Eight" token, awarded by Pine. "Like" token, awarded by Shizhao. It would be nice to have a graph/graphs of page views over time in MediaWiki's info action. 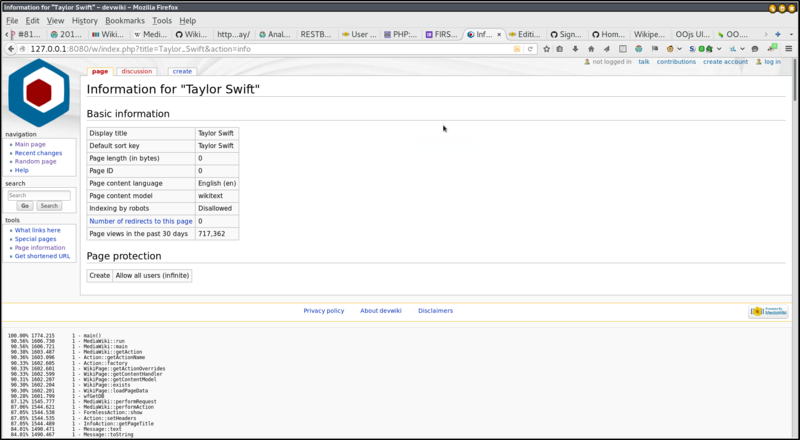 T56184: Fix TreeViews to provide pageviews statistics for all articles of any wikiproject etc. bzimport set Reference to bz41327. I talked to David S. about this earlier today. The problem currently is that this data simply isn't available (yet). The analytics infrastructure simply isn't there (yet!). I think we'll see a usable API by the end of 2013. In the meantime, this gives us a bit over a year to get the feature request we do already have data for (bug 41329, "Add edit history graph(s) to MediaWiki's info action") implemented nicely (sanely). :-) This bug is going to be open for a bit, even though it's not really directly actionable right now. • Addshore added subscribers: Ricordisamoa, DannyH. Preliminary code is now in the WikimediaPageViewInfo extension in gerrit. Nemo_bis added a subtask: T110147: Add page view statistics to page information pages (action=info) [AOI]. 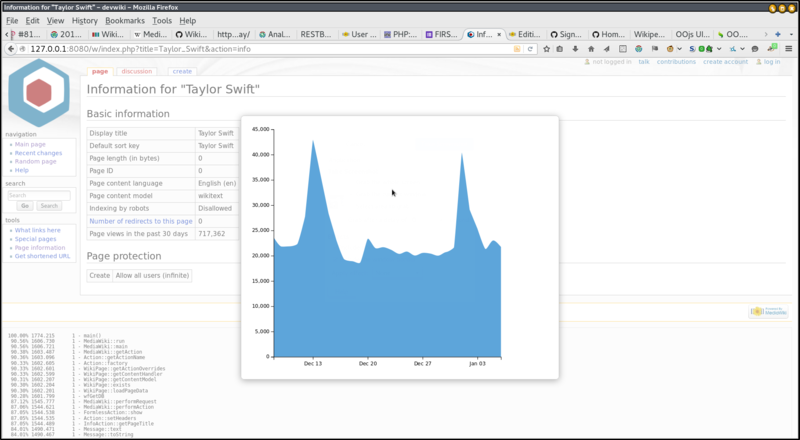 Nemo_bis added a subtask: T44259: Make domas' pageviews data available in semi-publicly queryable database format. Nemo_bis added subscribers: Nemo_bis, StudiesWorld, • Tbayer and 3 others. Legoktm edited projects, added PageViewInfo; removed MediaWiki-General-or-Unknown. Lea_WMDE removed a project: TCB-Team-Sprint-2016-05-04. The PageViewInfo extension is now live on sites such as https://www.mediawiki.org/w/index.php?title=Main_Page&action=info and https://en.wikinews.org/w/index.php?title=Main_Page&action=info. Yay! Possible improvements: T160243: Use non smoothed style for PageViewInfo graph and showing the graph without the extra click (compare to Commons which uses a Graph + system message hack to do that). Or at least make the graph more discoverable. I'm not sure how, other than by embedding it directly. Perhaps a button? Why is the graph not embedded directly into the page? Maybe like a thumbnail sized-version and clicking it can open a larger view? @Niharika: I think it's to avoid constantly invalidating the squid caches, although I wonder how we're avoiding that with including the total in the page. Seems like it would be just as problematic. I think right now it is pretty obscure. It's not very intuitive that clicking the total pageviews count would pop up the graph. Varnish ignores almost everything that has a query string. There is no performance difference whatsoever, it was probably just a design decision (as in: no one gave it too much thought). I'm closing this as resolved, since the functionality is enabled and available (and @Tgr did most of the heavy lifting at the end!). While it's not perfect, specific enhancement requests should be tracked in the PageViewInfo project.